Reims Cathedral, Notre-Dame de Reims (Our Lady of Reims), is by far the most famous building in Reims. The cathedral was constructed between 1211 and 1275. It was built on a site of an older church which had been destroyed by fire in 1211. 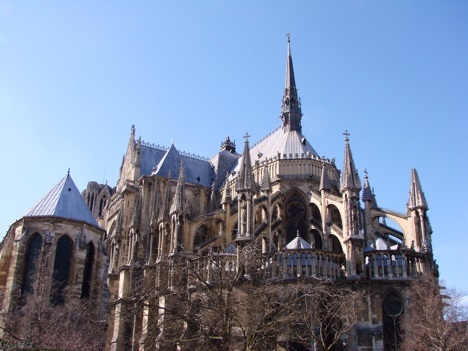 Both the previous church and the present Cathedral were built on the site where Clovis I (the first King of the Franks to unite all the Frankish tribes) was baptized by Saint Remigius (also known as Saint Remy or Saint Remi), bishop of Reims, in 496. Reims is the traditional location where Kings of France were crowned. In other words, Reims Cathedral traditionally served a role similar to that of Westminster Abbey in the United Kingdom. 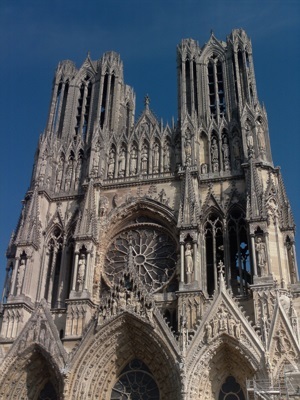 Reims Cathedral is today a major tourist attraction and receives approximately 1 million visitors each year.